The great Bum Airlines was born on the Hawaiian island of Moloka’i. My pop had invited me to learn the art of flying from him with the expectation of me taking over his business. I must be some sort of whiz kid, because after only a handful of lessons – in which I turned my plane into a fireball on three separate occasions – he decided I was ready to be responsible for ferrying passengers from country to country. Bum Airlines was going international. Flying a plane is obviously a complex thing to do, they’re full of hundreds of different instruments designed to ensure that you don’t make yourself crash and burn; Take Off has simplified all of this so that the process can be translated to a touch screen. Your throttle is a slide bar on the right, your joystick and tail rudder are represented by virtual joysticks on the bottom left and bottom-middle right of the screen while your speed, altimeter, heading, wing flaps and landing gear are concealed behind buttons across the top. It sounds like a lot, but it doesn’t take up a large amount of space on the screen, which is good at least. 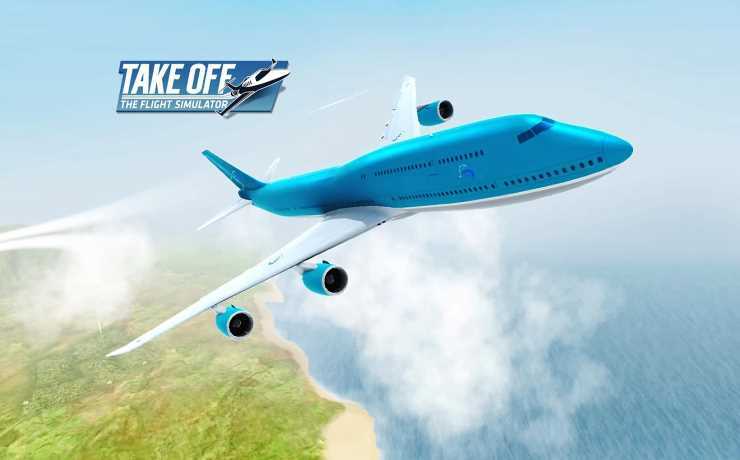 Take Off’s Campaign sees you tasked with performing certain acts under certain conditions, with fulfilment success granting a better financial reward. You’ll find yourself running tourist flights, chasing a criminal and having to land with a damaged plane; in fact the latter of those missions happens so frequently you’ll wonder how your airline ever managed to past strict safety checks. Progress far enough and you’ll unlock the World Map where pop pop gives you the money to buy your first plane for your fleet, the fact you’re taking over his business apparently isn’t good enough for you to inherit whatever fleet he had, but thems the breaks. From the globe you’ll be notified of locations ready to depart from and be able to specify locations for them to fly to; once you’ve made your choice you’re ready to take off, you fly through a few markers and job done. You’ve then got to wait until the plane reaches its destination until you then have to manually land the plane. All three steps can be skipped by paying currency, but this is in short supply, and more currency is gained by, of course, spending real world money. While you’re waiting for the plane to make its journey, you’re free to go back and do more campaign missions to earn more money (although how you’re managing to leave the plane and return while it’s in flight is unclear). Taking off and flying are pretty easy to do; with the flying itself proving to be pretty relaxing, the repeatitive drone of the engine complementing the rather boring landscapes nicely – although they do look ok when you’re flying over mountainous areas – the problem with the game is landing. It’s easy enough to line yourself up with the run way, and descend to the desired level, but as you approach, the camera always decides to cut to a top down view, impeding your ability to judge your height. Every time I crashed, it was because of that damn camera switch, and it never got any less infuriating. Camera issues don’t end there either. A lot of the time it won’t respond to adjustments meaning you’ll need to hit the camera button to try and get it back to where it was, but there’s like fifteen separate views and 80% of them are useless. The camera will also frequently snap cut to a different view and instantly back (kind of like the TV interference you get in horror films revolving around evil videotapes) accompanied by a quick buzz of static, it happens so regularly you’ll be forgiven for thinking it was your eyes that were glitching. All in all Take Off is an inoffensive game, the monetisation isn’t in your face, and general gameplay is nice enough to relax into. It’s just those frustrating camera issues that ruin the experience. With Take Off, it’s not the plane you’ll be wrestling with, it’s that god awful camera.